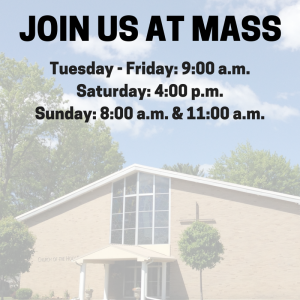 The Welcome Ministry is looking for individuals or teams of two to welcome our new parishioners. This does not take long. You would normally have one family every other month to greet. You will be provided with a church tote bag. The bag has information, prayer pens, and token gifts for the children of the family you are greeting plus the family’s names and phone number. This is one of the ways Church of the Holy Family is making a difference and being a more welcoming parish. Each September we have a reception for the families that have joined our parish during the past year. We can work with anyone’s schedule. Please contact Janet Barna at 748-0812 if you can help or for more information.